Physician formulated and tested, Dea Bella Eyelash Conditioner will enhance brittle, thin, weak eyelashes into longer, stronger, thicker eyelashes. 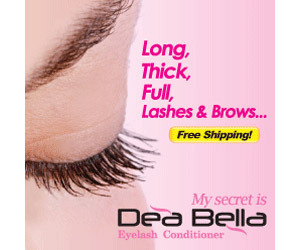 Dea Bella Eyelash Conditioner guarantees that you will have naturally beautiful eyelashes in as few as 2-8 weeks. Dea Bella can also be applied to your eyebrows and lower lash line if necessary.